So it happened I started this project with friend of mine, a new app to launch on the mobile market. I offered to write the server-side, a simple web API. Once he got my code he immediately asked me "Sam how do I know the routes and so on?! Write a documentation or something!". And then... Swagger came up. I presume many of you encountered this situation before or will in the future, a developer may write the best web API service but without proper documentation how can other developers discover and use it? 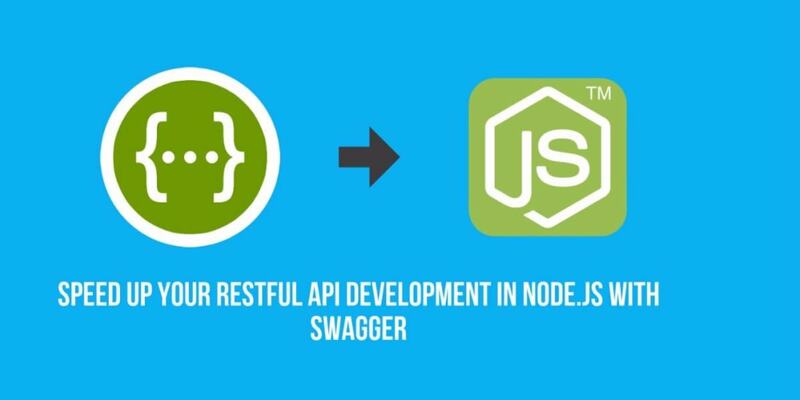 So in this tutorial I want to introduce Swagger, a famous open-source framework to help you write RESTful APIs. In addition, it is supported by many programming languages. This is the approach I am going to follow in this tutorial: We first focus on the design and then on the code. In the tutorial we are going create a RESTful API to manage our movies collection. You can directly clone the app repository from my Github here. A basic understanding of node.js, how to install packages etc. Let&apos;s move to the installation of Swagger. As said before Swagger is supported in node.js through its own module, here is the link to the github project: The documentation is pretty straight-forward to help beginners understand and configure Swagger. Once we open the command line we install the module (global). Now let&apos;s create our project. N.B. Each subfolder contains a README.md that for simplicity I didn&apos;t include above. api: As the name suggests, everything related to the API development, the controllers, mocks, helpers. A special mention goes to the /swagger folder which contains the file swagger.yaml, an important file we are going to edit to define everything related to the project information and routes. Throughout the tutorial I am going to explain it all so don&apos;t worry for now. config: It contains default.yaml that, as the documentation states, drives the application&apos;s config directory. Though we are not going to customize the file I still suggest you guys to read the related documentation to understand the engine beneath the "magic" of declaring APIs without writing a line of code but through yaml or json. test: Your test for controllers and helpers are (guess what!) created here. Obviously, app.js is the main file which runs the server. Have you noticed that there is already a controller called hello_world.js? Whenever you create a new project, the module adds an example route, a GET request to /hello which takes a name as parameter and greets the person. Not original at all, I give you that, but as we are beginners it is good see Swagger in action and get insight on how it works. What about taking a look at the example in action? In order to run the example I have to introduce Swagger editor. Docs on the fly generation. The picture above shows you the UI of the Swagger editor of our app. On the left you can see the yaml file we are going to edit (swagger.yaml remember?) while on the right the list of routes. By clicking on any of them we can have a good understanding of the parameter required, the format of request and responses, more generally a description of the route. If everything went well the editor should open a new tab in your browser. On the right side of the page you should notice the example path for a GET request to /hello, so open the tab and, at the bottom, click on the button try this operation. We are asked to enter a paramenter name: Go for it and test the route. x-swagger-router-controller: This is the controller, the file we have in the /api/controllers/hello_world.js. Then the http methods must be listed, in the example just a GET. operationId: This refers to the function, in the controller, in charge of the business logic. parameters: The list of required parameters are defined here. The parameter name is the only one and you may see that it is in the path, it is not required and it is a string. We can define a different response for each situation, given the http status or errors, a particular response can be defined. In the example, for the status "200" there is a pointer $ref to a response definition while for other statuses, we go to default with its own $ref. Why is that? In order to keep the yaml file clean, we can define all our response under definitions while at the same time reusing the definition for different responses. On the top of the file it has defined what the routes consume and produce, it is the format of the request parameters and related response. Those rules are currently applying to all the paths defined in the file. It is also possible to customize these rules for a single path/http method by including these properties inside of it. However, for the purpose of the tutorial, we will stick to application/json for all the routes, so a single definition on top is more than enough. Nothing exotic here, though you should notice that with Swagger the req object has a new property swagger which contains the parameters we defined. In the next section we finally start developing our app. Working with mocks does not require any code to be written, just editing the yaml file, so we can focus on the design part first. First of all, rerun the project adding the flag -m to the command which tells Swagger to run in mock mode, then run the editor in the second window. The first route returns the complete list of movies in our collection. First, we define our controller movie but there is no need to define the operationId in charge of the business logic. In addition, no need for the parameters. Take note, the successful response has a schema GetMoviesResponse. The response is nothing but an array of movies which contain a unique id, a title and the year. NB swagger editor autosaves whatever we input, which is great for us, but I noticed that sometimes is gets stuck. So if that is the case for you, try to refresh the page. Here is the code inside the editor which automatically created a better view on the right. Since we didn&apos;t define any operationId, in mock mode swagger returns a standard value according to the properties type. Since id and title are strings, it returns "string" while for the year, as a number, it returns 1. For the record, if not satisfied by the standard values, it is always possible to define the mock controller in /api/mocks and add a operationId. Then, the business logic just returns the answer in the format you defined in the definitions, but you can customize the values for each property. However, I am not going to cover this step because I want to stick to the promise of working with mocks without writing a single line of code. NB We declared the two fields title and year as required. So to speak, we have a success field set to 1 and a description of the operations. This will be a common response for all our routes when we create or update a movie, the only difference will be the description text. Now let&apos;s retrieve a single movie. This time we need the parameter in the path, precisely the unique id. Notice that this time the parameter, in its own field in has path as value. I really like the order to define the parameters, no matter if they come from the body, path, header etc. They are all consequently listed where in assumes the correct value. The last operation, let&apos;s delete a movie by a given id. There is no need to further discuss the yaml file, we simply define the parameter and the response is GeneralResponse. The first thing to implement is the data-storage logic. Well, for the purpose of the tutorial we are not going to use any real database (MySQL, Mongo...) but simply store the data in memory for the time the app runs. Let&apos;s create a file db.js /config. We are going to export a simple object which mocks the DB operations of add, retrieve, update and delete movies. * Save the movie inside the "db". * Retrieve a movie with a given id or return all the movies if the id is undefined. * Delete a movie with the given id. The names of the functions are the same as the traditional operations with Mongoose. The first property is a list to store all the movies in the collection. Save: We need to create a unique id, here is where crypto comes to help. Find: If the id is passed, then it returns the specific movie, all the list otherwise. Update: Update the movie if it exists in the collection. NB it is very likely some of you may find better ways to implement the operations above, or even point out that I should return a shallow copy of the list instead of the property itself. Because this is just a simple demo to fake CRUD operations, I would suggest you customize my object for your needs or even connect to a real database. We first included our db and then exported all the functions we need to use as operationId and handled the business logic. Notice that in the case that the id belongs to a movie, getOne, update, and delMovie return the same formatted json. We defined the same schema in the Swagger editor earlier. On the other hand, in case there is no movie with the id of the request, we send a status of no content "204". Side note, a true Star Wars fan must have noticed that year of "The Empire Strikes Back" is wrong, it was released in 1980. In addition I forgot a "s" in the title. Good, time to update the movie! The NOCONTENT response confirms it all worked. In this tutorial we have seen how Swagger helps to develop a robust RESTful API while at the same time providing an elegant documentation that can boost up cooperation among developers (for example backend and frontend developers). We covered all the basic requests, GET, POST, DELETE, UPDATE to manage a movie collection. At the same time we practiced with parameters by handling them from the body or the path. On Scotch.io there is a cool tutorial to authenticate a node.js API with JSON web tokens. Why don&apos;t you try to rewrite with swagger to practice with header parameters? Last but not the least, I remind you again to take a look a the documentation on the official website for a deeper understanding of Swagger. I am a full-stack web developer working for Taroko Software as front-end web developer and Filestack Tech Evangelist. When not coding I may be spotted in a gym lifting or planning to conquer the world LOL.